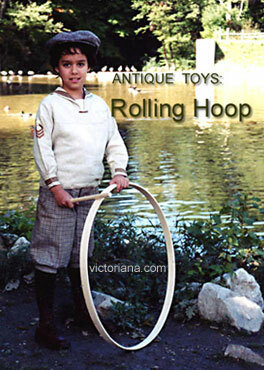 Hoop rolling, also called trundling a hoop has been a favorite outdoor activity for children for centuries. Hoops were shown in an engraving for Jacob Cats's poem Kinderspel as early as 1628 and were frequently included in illustrations of children's activities and games in the late 18th and 19th centuries. Early hoops were of metal; in the 1800s, handmade wood hoops were all the rage as a favorite plaything. 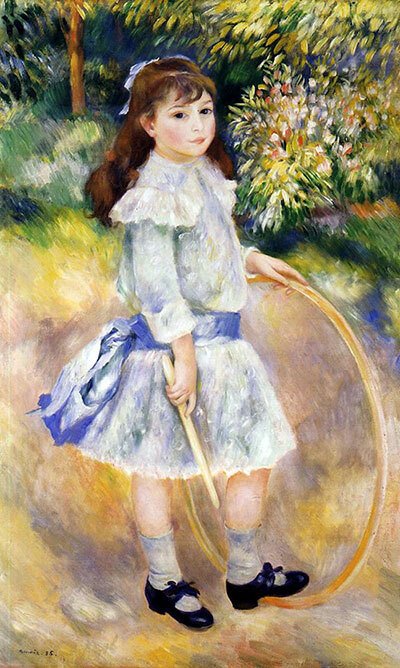 The child's hoop was propelled by stroking a one foot dowel or stick along the top. The 20th century hula-hoop is a modern day version of this treasured plaything. 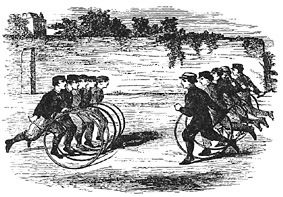 "Rolling", "bowling" and "trundling" a hoop really came into its own in Victorian times. Hoops were raced and used for skipping. 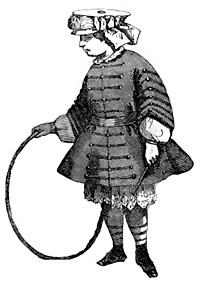 The Youth's Best Friend, an early book of instruction, illustrates trundling a hoop with the comment that, "This is indeed a very good sport for little boys, but only in cool weather; some little boys make themselves very hot... by which they often become very ill."
Many 19th century portraits and photographs include a hoop along side the posed child as seen in the painting "Girl with a Hoop (Marie Goujon)" by Pierre-Auguste Renoir (1841-1919), 1885. 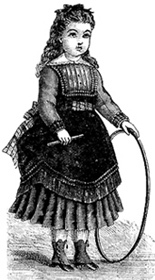 Before attempting any of the hoop games it is well to understand how to trundle or roll a hoop. Hoops were made of two materials—wood or iron. Wooden hoops were trundled by being knocked with a stick; iron hoops were propelled in the same manner but it was better to use a hook. The hook was an iron rod about six or eight inches long, curved at one end, and fitted with a wooden handle. 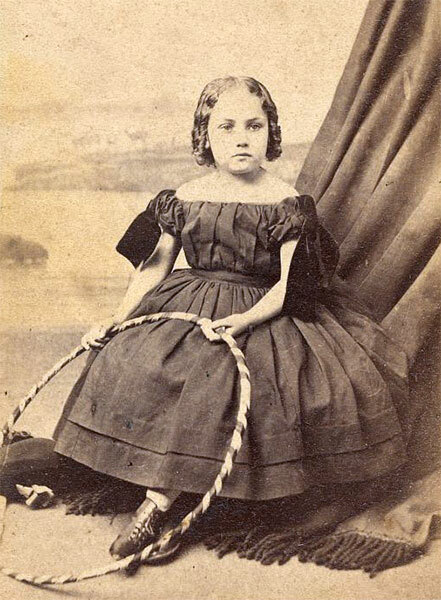 Wooden hoops were toys generally allotted to girls while iron hoops were usually played with by boys. 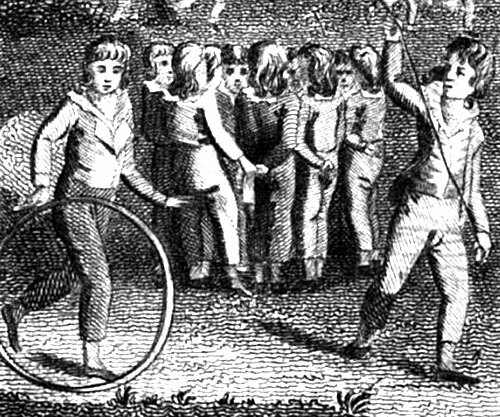 Hoop trundling was a pastime mostly played by boys under twelve years of age. There was a genuine and healthy excitement to be had from a good hoop race, success in which demanded nimbleness of foot, lightness of touch, and dexterity in management. 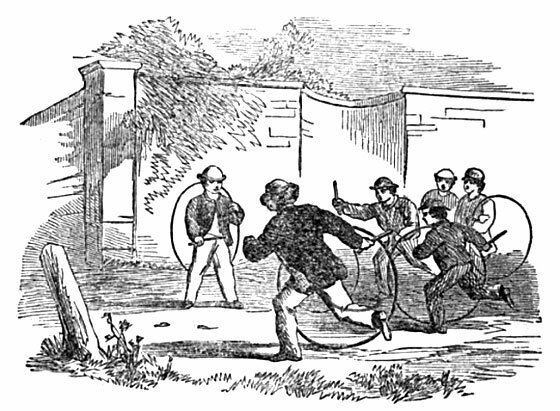 To trundle a hoop with the aid of a stick required little instruction or practice, but the use of the hook was not so simple. When using the stick careful guiding touches were required to the right and the left of the hoop from time to time to keep it in a straight course; but with the hook, the hoop was guided in any direction without any apparent change of manipulation. The hoop would be started by a gentle stroke from the straight part of the hook; the hook was then pressed on to the hoop more than half-way down to the ground, the pressure being applied more or less gently, according to the speed required. It was then found that without removing the hook the hoop could be kept trundling at any desired pace. Moreover, by the slightest possible turn or twist of the wrist, the hoop could be guided into any desired direction. With the hook, the sharpest of corners or the smallest of circles were made without any risk of overturning the hoop; such feats could never be attained by the stick. Ingenuity devised many descriptions of hoop games. In the 1900s, it was not unusual to see young boys rolling hoops through city streets – causing havoc to the horse and buggy traffic. 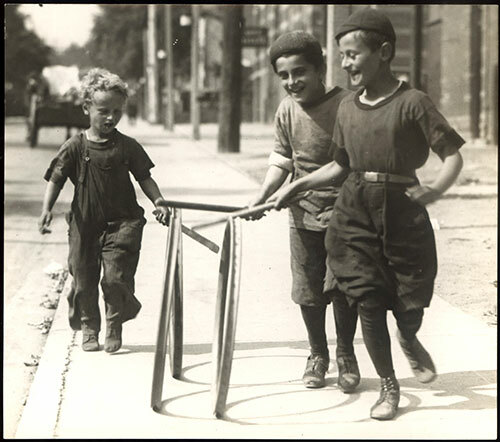 This photograph features young boys playing with hoops in 1922. Antique collecting software allows collectors of vintage and antique toys, dolls and books to keep a visual record of the appearance and condition of items in their collections, and to identify individual collection records at a glance. With the best database software for toy collectors users can create as many collections as needed with a single copy of the software.